If you are looking for bright colours in the stems of a plant then maybe try Cyrtostachys renda or ‘Lipstick Palm’. syn Cyrtostachys lakka also known as the Sealing Wax Palm. This is a feather type palm and it is the brilliant colour of the crown shaft that makes this such a stunning feature tree. 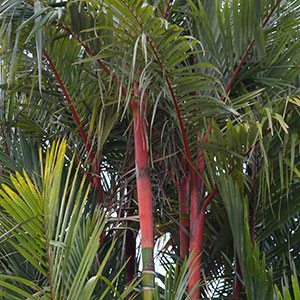 This is a frost and cold sensitive palm, generally regarded as a slow growing slender tree the Lipstick Palm is naturally clump forming and is most attractive and desirable palm for tropical and sub tropical climates. Originally from southern areas of Thailand and is an understory plant and Cyrtostachys renda) was formerly known as Cyrtostachys lakka. It is also referred to as the ‘Sealing Wax Palm’. Being highly ornamental palm makes an excellent addition to plantings around tropical resorts. Fantastic red stems on new growth with great foliage above. Growth rate is regarded as slow to moderate, and over time the Lipstick Palm will form a clump. This is a tropical palm and requires appropriate condition s to perform well. Cyrtostachys prefer a damp environment, low a humid climate and work well in the landscape planted as a group or even in a large pot. Remember to keep the water up to these as they come from South East Asia and Borneo and grow in damp areas. Regular fertiliser applications will be required in all but the best soils. We suggest using a slow release type fertiliser twice a year. Propagation is by division of established clumps, or from seed. The best seeds are those that are very fresh and they will need warm temperatures to germinate well. We suggest using a heated propagation tray for this purpose. 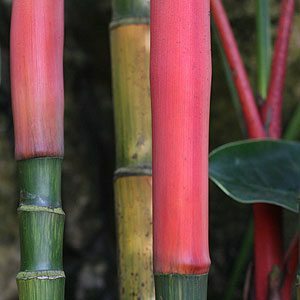 It is much easier and quicker to buy established seedlings or potted specimens, however you can grow Lipstick palms from seed, or divisions. Propagation is possible from seeds if you can find fresh seeds. The seeds need to be cleaned before germinating, soak them in water until the outer husk softens and can be removed. You will need a heated propagation tray to maintain a constant temperature between 20 C and 25C. Soak cleaned seeds in warm water for 48 hours before planting. Seeds can be planted in a seed raising mix or a coir peat mix. The seeds should be planted with the top exposed. The seeds need good light, moisture and warmth to germinate. Mist spray daily, although in a heated propagation tray this may not be needed as often. Do not allow the seeds or propagation mix to dry out at any time. Be patient as fresh seeds can take up to 10 – 16 weeks to germinate. Older seeds up to 10 months. A simpler method with fresh seeds is to clean them, soak them in water over night and then place them in a ziplock bag with adequate sphagnum moss. This is the favoured method of germination. Again keep warm, moist and with some good light. Once seeds have sprouted they can be potted up into individual containers and kept moist, but not wet. Propagation by removing suckers or offsets from established clumps. Look for the smaller offsets as these are more likely to be successful. You will need total some root system with any division. 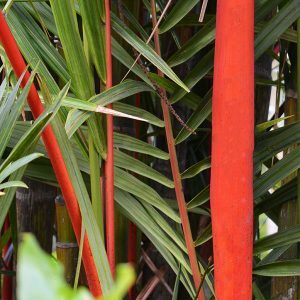 Common Names – Lipstick Palm, Sealing Wax Palm. Height – Will reach 6 metres (18ft) in height. Growth Rate – Moderate to slow.